Can I purchase new downloads/scripts from within the app? Tap the 'Search' icon on the bottom of the screen. Tap the 'Search' button at the bottom of the screen. 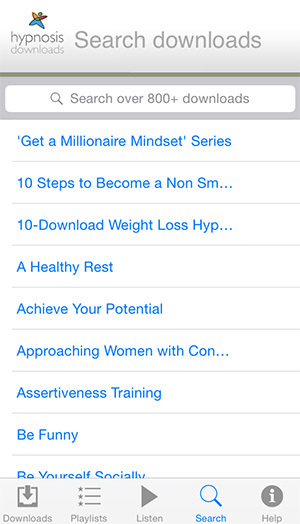 Tap the link for the title that interests you. Your browser will open the information page for that download/script/pack. 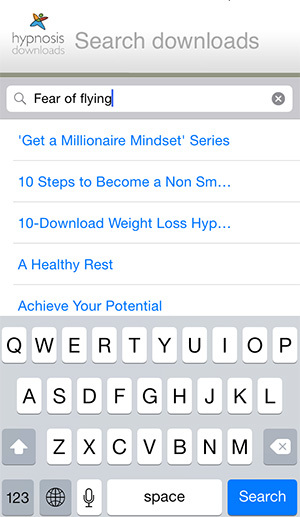 To purchase, scroll down and tap the 'Add this download to my cart' button. When you're ready to check out, tap the 'Proceed to Checkout' button on the My Cart screen. 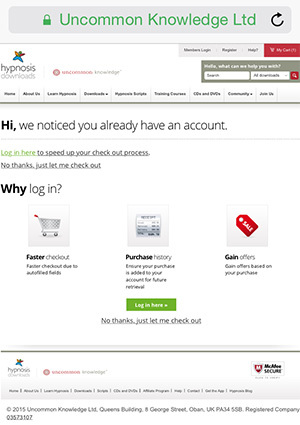 Tap 'Log in here to speed up your check out process'. On the next screen, enter your email address and password, then tap the 'Log in' button. You'll be taken to the Secure Order Form. If you'd like to pay via PayPal, tick the 'Prefer to use PayPal?' box. Otherwise, scroll down and fill in your payment card details. Tap the 'Place my order' button and complete the purchase process with your chosen payment method. Growth Zone members, please note: Adding a download/script/pack to your cart when you're not logged in and following the 'Log in here to speed up your check out process' link will take you to the Secure Order Form. 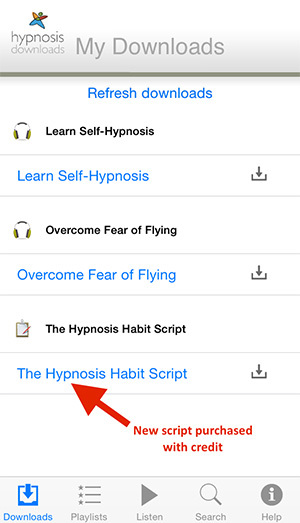 In your mobile browser, visit HypnosisDownloads.com. 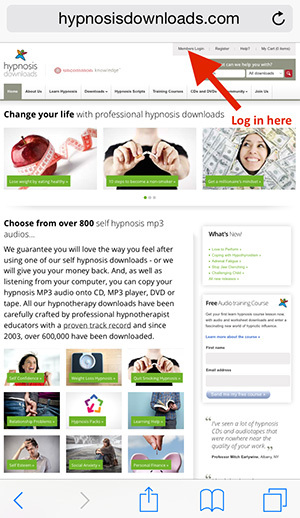 Enter your log in details and tap the 'Log in to Hypnosis Downloads' button. 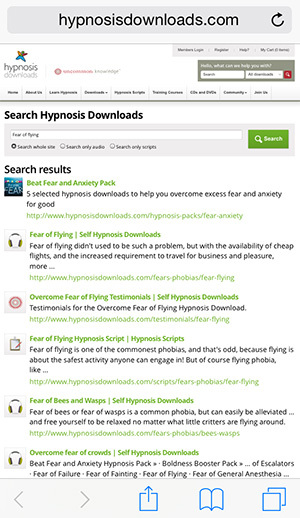 Search or browse for your desired download/script/pack (either in the mobile browser or in the app). Tap the 'Add this download to my cart' button. On the 'My Shopping Cart' screen, tap the 'Pay with Credits' button. You will be asked to confirm that you have chosen the correct product. If so, tap 'Confirm Order'. The 'Purchase Confirmed' screen will display. 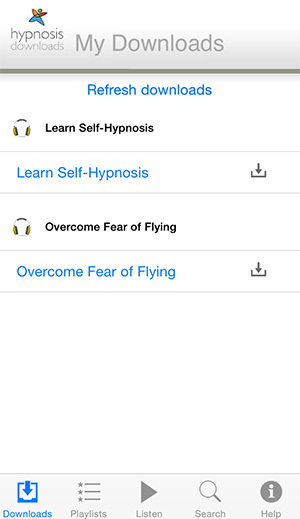 Return to the Hypnosis Downloads app. If the 'My Downloads' screen does not refresh automatically and display your new item, tap 'Refresh downloads' at the top of the screen and your new purchase should pop up! 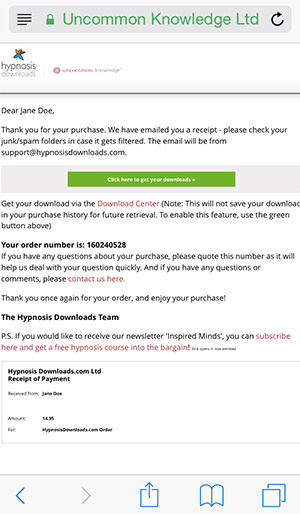 If you remain logged in to the HypnosisDownloads.com site in your mobile browser, you should be able to complete future purchases from the app with your credits without having to log in again.